NucNet) New Mexico has allowed US-based Holtec International to buy about 1,000 acres of land to be used for the construction of an interim spent nuclear fuel storage facility. The area is literally a hotbed of nuclear energy activities. Holtec is planning to build and operate an underground consolidated interim storage facility (CISF) in New Mexico and plans to file its license application with the NRC by the end of November. The planned spent fuel facility will use Holtec’s Hi-Storm Umax subterranean storage system which can store all US commercial nuclear fuel types, Holtec said. The firm said in a public briefing that it expects to begin operations in 2020. The site is located a few miles away from the DOE WIPP site in far southeastern New Mexico. The nearest towns Carlsbad, NM, to the west and Hobbs, NM, to the east. The area is also home to Unrenco’s uranium enrichment plant located just east of Eunice, NM. 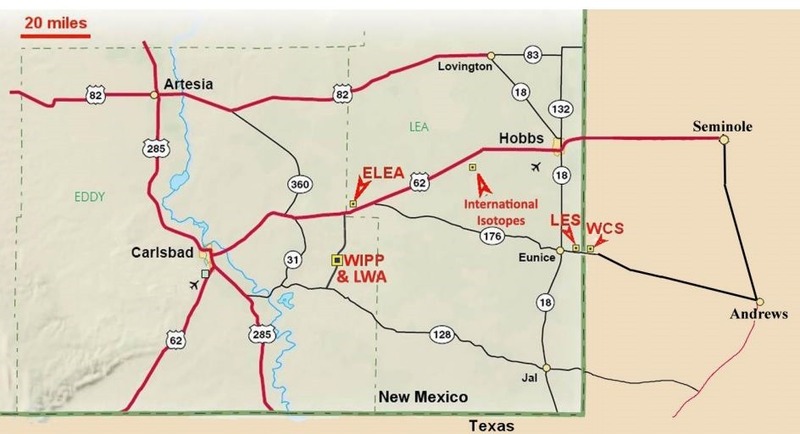 International Isotopes, of Idaho Falls, ID, has plans to build a uranium deconversion plant on a 640 acre site west Hobbs, NM, to support fluorine extraction from depleted UF6. The product can be used in petroleum operations, photovoltaic solar cells, and refrigerant and aluminum production. A 40-year NRC license was approved for the project in October 2012. The firm has a signed deconversion contract with Urenco. Mike Ford has accepted the position of Vice President of Licensing and Corporate Compliance at WCS. Ford previously served as Chairman of both the Texas Compact Commission and the Texas Radiation Advisory Board, and most recently, as a consultant to WCS on radiation safety projects. Ford is a Certified Health Physicist; he received a B.S. in Radiological Health Engineering and an M.S. in Health Physics from Texas A&M University. He will manage the ongoing application process with the NRC to license, construct and operate a Consolidated Interim Storage Facility (CISF) for used nuclear fuel. The firm intends to initially build a 5,000 metric ton above-ground storage facility for interim storage of spent nuclear fuel on its 14,000 acre site located west of Andrews, TX, just off state highway 176. It plans to build up to eight storage units to host up to 40,000 MTHM of spent fuel. WCS has partnered with waste storage and transport experts Areva and NAC International for its project, which would see spent fuel canisters located at decommissioned power plants transported by rail to the CISF facility. According to the license application filed with the NRC, the Electric Power Research Institute estimated the operating and labor cost needed to store 5,000 MTU of SNF at an interim consolidated storage facility for 40 years at just under $400 million or about $10m/year. To be precise, the figure cited is $394,612,500. WCS will obtain funds to operate the CISF based on a contract with the DOE. WCS expects that the DOE will be its only customer for storage of 5,000 MTU of SNF. WCS cannot receive spent nuclear fuel until a contract with the DOE is provided to the NRC as a condition of the license. (WNN) Terrestrial Energy USA has been invited by the US Department of Energy (DOE) to submit the second part of its application for a US federal loan guarantee to support the licensing and construction of its Integrated Molten Salt Reactor (IMSR). The company is applying for a loan guarantee of between $800 million to $1.2 billion to support financing of a project to license, construct and commission the first US IMSR. 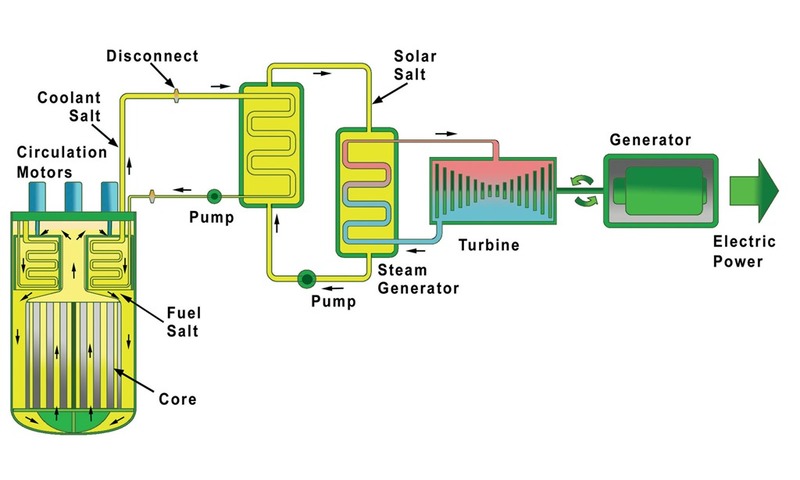 Molten salt reactors use fuel dissolved in a molten fluoride or chloride salt which functions as both the fuel (producing the heat) and the coolant (transporting the heat away and ultimately to the power plant). In a press release date 9/13/16 the firm said it has identified a number of potential sites suitable for the first commercial IMSR power plant deployment of its 190 MW design. The firm said the Idaho National Laboratory (INL) is a lead candidate site, and also a center of research excellence for the integration of nuclear reactor systems into industrial heat applications and hybrid energy systems. The company added in a statement to World Nuclear News that it is working with Idaho National Laboratory to develop one of several IMSR siting plans. It is not clear whether Terrestrial Energy simply wants the infrastructure and security of the remote Idaho site or whether it would also want to partner with the DOE lab for technical collaboration to develop its reactor design. So far the firm has raised about $20 million in Series A funding. Success with a DOE loan guarantee application would go a long way to securing funding to achieve its goal to design, license, and sell a first of a kind unit to a customer. Locating at the INL would follow in the footsteps of NuScale which has partnered with its customer UAMPS to build a small modular reactor, using conventional light water reactor technology, at a site at the INL. Officials at the INL declined to comment on both the statements in the company’s press release and the WNN report. Also, an executive from the company declined to make any statement beyond what is in the press release. A search on Google produced this fact sheet by INL on the technology. A search of the INL web site using the term “molten salt” produced no results. However, as late as 2014 the INL was reported to have simulated the performance of molten salt inside a reactor vessel using high temperature steam and a molten salt bath. (Reuters) State-controlled South Korean electric power utility KEPCO has plans to invest in a 10 billion-pound ($13 billion) project in Britain to construct a new nuclear power plant near Sellafield, northwest England, the Financial Times reported 9/12/16, citing sources close to the negotiations. According to the Financial Times report the Korea Electric Power Corporation is considering taking an equity stake and a role in constructing the new Moorside Power Station. NuGen, a joint venture between Toshiba and French utility company Engie, plans to build three 1150 MW AP1000 reactors at the Moorside site on the coast in Cumbria and expects electricity generation to start in 2025. “We are looking for investors and are talking to a wide range of people,” said a spokesman for NuGen when contacted by Reuters, declining to comment on whether talks were taking place with KEPCO. NuGen is expected to have a generating capacity of up to 3.8 gigawatts when all three reactors are completed, around 7 percent of Britain’s total electricity demand. (Nuc Eng Intl) Russia’s BN-800 reactor at unit 4 of the Beloyarsk NPP, a sodium-cooled fast neutron reactor, completed 15-day integrated trials operating at 100% on 9/2/16. The trials confirmed ability of the power unit “to bear load steadily at the nominal power level as per design parameters without departures”, a plant statement said. It was the last stage of testing for the BN-800 equipment. The 789MWe Beloyarsk 4 was first connected to the grid on 12/10/15 and brought to the rated power for the first time in late May. (NucNet): Kansai Electric Power Company has published details of work it will carry out to improve the safety of its Takahama-1 and -2 nuclear reactor units in Fukui prefecture, southwest Japan, in an effort to operate them for 60 years, the Japan Atomic Industrial Forum (Jaif) said. In June 2015 the two units were approved to have their operating periods extended to 60 years, or two decades beyond the original 40 years. It was the first time that nuclear units in Japan had been granted such clearance. However, various upgrades need to be carried out including installation of shielding for the upper parts of the containment vessels, replacement of refuelling water tanks, additional fire protection, relocation of the seawater intake facility for Unit 2 and replacement of central control panels. The work is scheduled to be completed the work during the 2019 fiscal year, Jaif said. Both units are 780-MW pressurized water reactors. Takahama-1 began commercial operation in November 1974 and Takahama-2 in November 1975. They have been shut down since inspections in 2011 following the Fukushima-Daiichi accident.